A non toxic sustainable floor finish that gets very hard, very fast. Practically odorless. Walk on quickly. A safe floor finish. Hard yet low Odor. No polyurethane. There are no voc "exempt" solvents hidden away. No isocyanate use at any point from manufacture to landfill. Our safest, lowest odor Floor Finish. Be done in a day and know it's done right. A Healthy Sustainable Floor Finish that is so flawless it actually looks like a fine hand rubbed finish. Why its Great: It's fast. It's affordable. Its Safe and anyone can apply it with a mop and brush. It comes in dozens of natural wood tones so you can stain and seal the wood in the same coat, rather than staining first and then coming back the next day to recoat. ​It has a very beautiful natural satin sheen and gets hard fast. 2-4 coats can be applied in the same day with practically NO ODOR that night.Its unusual for a high grade film forming finish like this to have such a natural and preferable sheen to it. Sheen: Natural Satin Floor Finish. Coats Required: 1 to 4 THIN coats of floor finish on Raw wood. Method of Application: Mop, brush or spray floor finish over raw wood. Dry Time: Varies by climate. Typically 30-60 minutes for floor finish. 1-2 hours for furniture, trim. Recoat: 60-90 minutes, lightly sand floor finish between coats with 120-150 or 220 depending on level of smoothness desired. Dilution: None necessary. We add 16 oz of water to a gallon when staining with Aqualine Satin just so it's easier to stain with. Smell in the room that night: Hardly detectable. Maintenance: For daily cleaning use Earth Clean diluted as indicated for floor washing. To touch up or recoat, lightly sand any rough or loose areas, wash with Earth Clean and recoat as needed. Limitations: Maintain application temperature above 65F. Use on Raw wood or over itself only. Do not apply over oil based stains or existing finishes*. *If you are refinishing an old floor or using an oil based stain, Use NanoTech Floor Finish for your first "Clear" coat in these situations. Then mop Aqualine Satin Floor Finish over NanoTech. This is a super durable finish, suitable for residential and commercial floors. It allows you to recoat existing floors and oil based stains without the need for toxic oil based finishes. 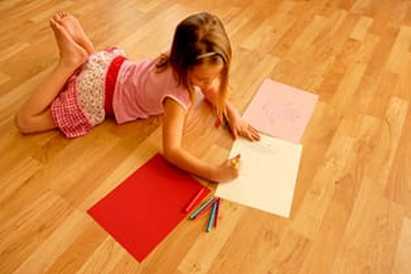 ​​Why is Aqualine Satin a Healthy Sustainable Floor Finish? The select, 100% pure acrylic in Aqualine Satin is of the highest grade available and is very safe. 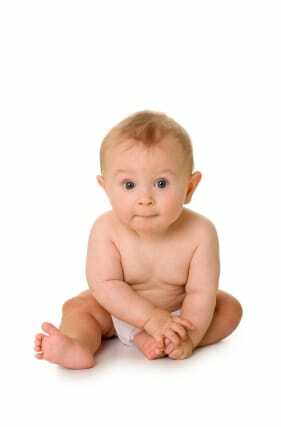 Pregnant women, babies, kids and those who are chemically sensitive tend to do very well with this product. Yet floor finish contractors love it because it works great and has the same application method they are used to. It's a gorgeous floor finish that is POLYURETHANE FREE! No isocyanates. NO NMP! No Ethylene Glycol! This becomes apparent as soon as you realize there is practically no odor and the floor is finished! Ready to be used. The same day! WOW! Aqualine Satin is a floor finish made from a pure non toxic acrylic. When properly made, pure non toxic acrylic resin is highly durable and carries a low ecological footprint. Certain types of acrylic are very safe when carefully formulated. For instance, joint replacements, dental implants, suntan lotion, fleece clothing, aquariums. All of these are safe for human beings (and fish) and this is well proven over time. BUT, please, remember there are many acrylics that are not made in a healthy sustainable manner and often paint labeled as acrylic is actually blends of less safe resins. Do You Prefer Semi Gloss? Try NanoTech Sealer. This is our semi gloss Floor Finish. Bhopal Isocyanates : The Bhopal isocyanate chemical disaster must always be remembered. To be fair this particular isocyanate [MIC] may no longer be used in commonly produced polyurethane today. However, the isocyanate are very powerful and the chemical class as a whole is poorly studied in humans over long periods of time. We can all learn from from what happened there and God bless all who were harmed. Oceans of isocyanate are made every year and much of it is used unnecessarily, as Aqualine Satin proves. The Earth simply cannot handle oceans of poison made, year after year after year. There is a proper time and place for isocyanate use but that use must done with extreme care. MDI and TDI are commonly used diisocyanates in polyurethane production today. Human studies, aquatic fate and and environmental reactions are things that we feel are harmed by over use of isocyanates. There are many good uses of poly but even those within the isocyanate industry acknowledge more must be learned.